This was the first year I was able to attend HDI (Health Data Innovation)/Health Data Palooza in person. HDI is a joint effort of the IOM, CTO Todd Park and HHS. It is a great coming together of open data sets, innovative thinkers, investors and hacktivists. This year I had a booth! If you went to the exhibition floor you would pass row upon row of mobile health apps and health data interfaces. If you walked by those, to the end of the row, you would find me in booth #31. 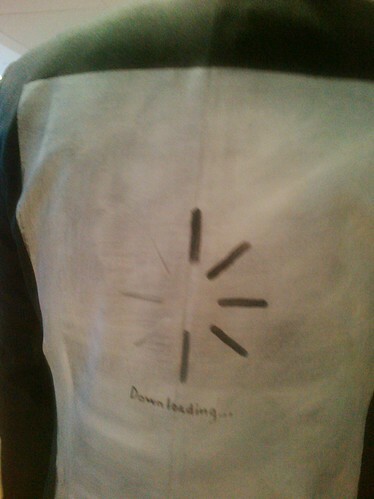 I was painting data on a canvas while beside my easel was Don Fluckinger’s unfinished Walking Gallery jacket depicting the classic download spinner icon. This was my first time at HDI as a walking talking human being, but I have attended every HDI as a form of painted data access. I was an entrant in the first Health Data Innovation event in June 2010. I received an honorable mention for my painting Apples to Apples that compared clinical data sets to patient satisfaction. HCAHPS Visualization from Eidolon Films on Vimeo. The entry was a video, as the painting process was captured in real time by filmmakers Tessa Moran and Ben Crosbie on a busy street in Washington DC. My research partner in the endeavor was the amazing Ted Eytan, MD. No, I did not get to attend in person in June of 2010, but was well represented on stage that day by a painting on Roni Zeiger’s back. In June of 2011, I once again missed the opportunity to attend HDI. The window of time to reserve a ticket was very small. By the time I was aware of the event, the event was full. 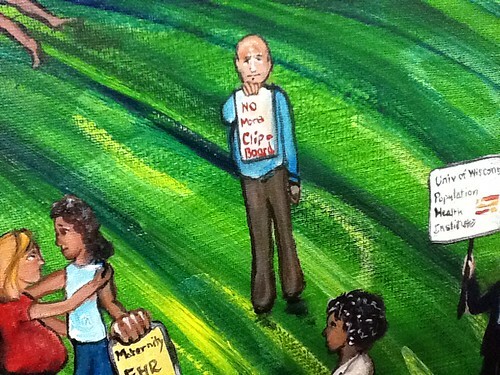 HDI:2 was a couple of days after the first gathering of The Walking Gallery in Washington DC. 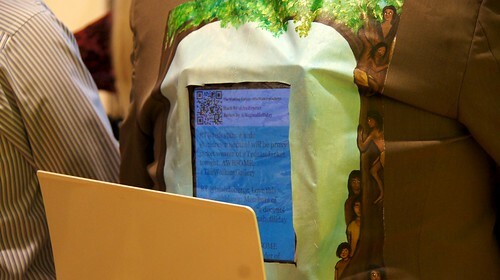 There were several members of The Walking Gallery who attended. Walking art would represent me. This year I waited with baited breath for registration to open and reserved my ticket on day one. 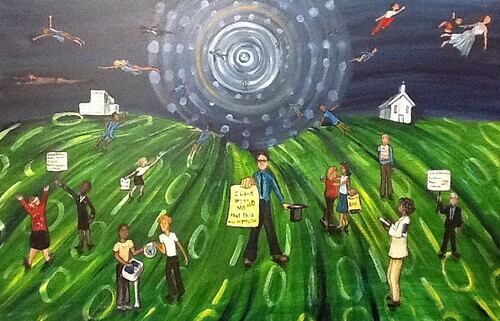 I communicated heavily with Danielle Turpinseed from IOM and Aman Bahndari from the office of the CTO about my desire to paint onsite as part of The Walking Gallery. 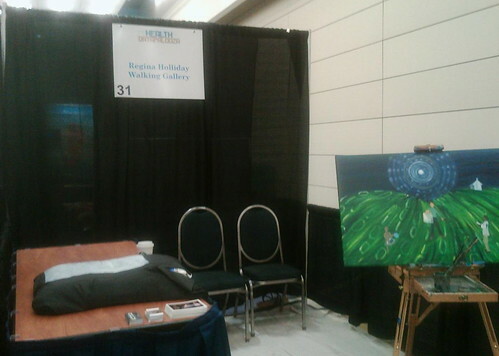 They said I would be allowed to paint in the large plenary session room in the mornings and then in the exhibition hall in the afternoons. I painted the sky and landscape of this piece in the back of the room. It was very hard to paint, as the lights were so low. I could barely tell the difference between the colors of my palette; often I would use my smart phone as a flashlight to distinguish color and tone. 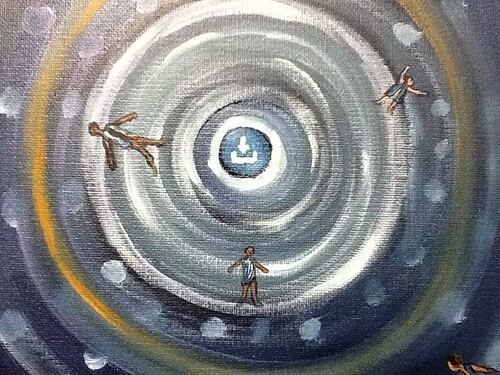 In this darkness I painted the binary landscape that supports us all and I painted a data portal that is the logo of HDI. After three hours of trying to see with little light I had a pounding headache. 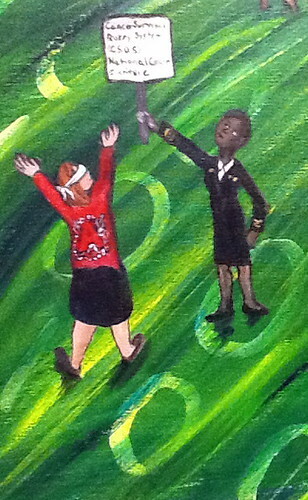 I took down my easel and moved to the exhibition floor to paint the details of this piece. 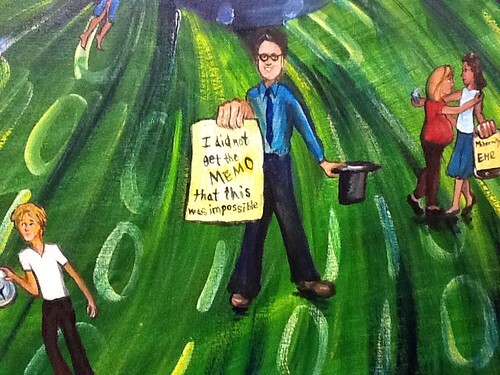 In the center of this painting, Todd Park stands with an energetic confidence as he shows the viewer a piece of paper: “I did not get the MEMO that this was impossible.” In his other hand he hold the magic hat of the oncoming tides of open data. To his right, Alisa Hughley, from enBloom Media, writes notes about his speech upon her Ipad while wearing her freshly painted gallery jacket. While further back in the background, Bryne Potter from Private Practice shows a patient facing EHR designed for use by a midwife and her clients. Next, I painted about The Community Health Dashboard being used by the NYC Dept. of Health and Mental Hygiene. The speaker mentioned the positive results they had seen in lowering Cholesterol by using local Churches as a check in site for data collection. Then Jon Bon Jovi introduced Project Reach App challenge. He told the assembled why he was inspired to do this work. He was part of the closing shift at his Soul Kitchen, a place where people pay what they can to eat, a place where the stigma of charity is replaced by the pride of a job well done. 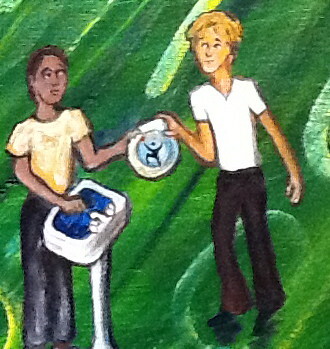 That night they had an amazing dishwasher, who kept washing as the kitchen closed around him. Jon suddenly realized that very likely this man had no place to go. Jon launched Project Reach, a contest to encourage developers to create and app that would help the less fortunate find out in real-time which clinic could help them and which shelters had beds available. Jon is working with HHS, HUD and the VA to make his dream a reality. We also heard about the iBlueButton from Humetrix. So blue button become s the center of HDI’s logo. Here download and transmit combine as patients fly in and out of the fluid data of care. I did slip out of my booth for a few moments Tuesday June 5 to see the breakout session "Consumer Engagement Using Health Data." The part I was able to see was facilitated by Lygeia Ricciardi from ONC and Judy Murphy I came to see Karen Herzog, Tiffany Peterson and Alan Greene speak as patients and caregivers on the panel. They were all great. Though I missed I hear they even had an exercise break mid-session. Go patients! On day two, I had learned my lesson and set up my easel by the natural light streaming in from the corridor. I heard the presentation about the Cancer Survival Query System by the National Cancer Institute. It sounded like an amazing app that would allow doctors to have a realistic and supported conversation about cancer care options no matter the current stage of disease. I was saddened to hear this app would not be able to be viewed by patients. So I stand within the painting blindfold on hand reaching out to grasp an app that’s out of reach. During my time in the exhibit hall, I listened to all the stories crashing around me. Chiara Bell was there with a new app for Careticker called KnockedUP. In the painting she strides up the data hill. Jeff Donnell, President of No More Clipboards, stares defiantly at the viewer. He dares us all to give up the vestiges of a paper medical records system and dive into the world of digital. To the left of Jeff, Pat Remington, MD, Associate Dean for Public Health University of Wisconsin holds aloft a sign reminding us to focus the power of data on the world of public health. All the while I painted this, every few minutes someone would stop to ask me about all the paintings walking around. 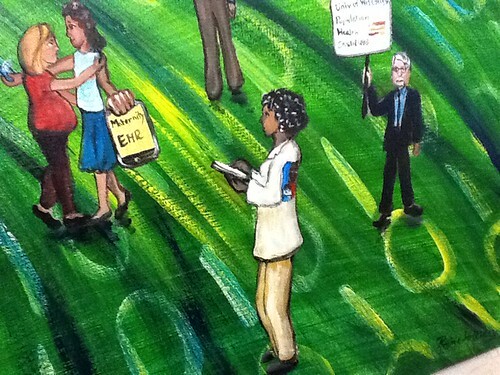 Many of these data folks seemed very confused by art at a health data conference. I wonder if they have heard about the new aesthetic. Can you truly understand data without artifact? Did people in attendance really think the term “Health Data Palooza” was only a cute affection? Bill your event as an endless data party and you should expect rock stars on the stage and poets in the audience. As I remarked to my friend e-Patient Dave, "Folks can't go around shouting 'Data Liberación!' 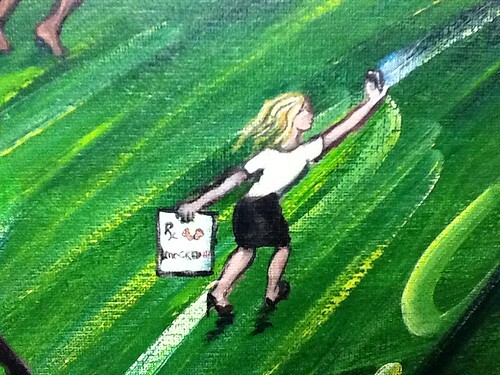 and not expect a painter to show up :)"
The Walking Gallery is a living manifestation mobile health app. It has viral spread and unlike many apps, continued use is quite common after initial down load. We are rapidly reaching scale supported by social media and novel economic structures. We are more of an up-start than a start –up. If Todd were to ask me what would take Health Data Palooza to next level, I would say simply, every app on stage could use a puppeteer explaining code or a poet performing a spoken word data set. When I look at apps I would like to see art imbedded from the beginning and not as an afterthought. I see a new aesthetic finding its way into health data. And of course we need a lot of patients included, in design, on the stage and in the audience. It is good that more and more of us our showing up. There was quite a crowd of patients in the audience. Both Tiffany Peterson and Karen Herzog presented on a panel in the afternoon session of the first day. I only saw the last part of that presentation so the only reference to it within the painting is all the flying patients. Your painting is very beautiful. Thanks What a great info you have given us by your blog. I like it and will share it to my friends.